Another great illustrated children’s book, recommended by Kerry of Mothering Arts, this one stands out for its very intricate and imaginative illustrations. It is a large illustrated children’s book – meaning big in size, too heavy for a little one to hold by themselves, perhaps. However, the large size really allows children to pour over every detail in these fanciful and beautifully crafted illustrations. Many of the illustrations are two-page spread, allowing even more space for the eyes to wander in wonder. Often, the text of an illustrated children’s book is secondary, and really serves to orient the children to the visual. Of course, the story needs to hold together and hold interest, but it is the artwork that captivates the children in large books such as this one. In this instance, this story is also extremely informative and educational. More than looking for a treasure where X marks the spot, we also find out something about electricity and its invention. 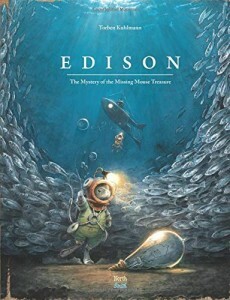 This illustrated children’s book is about Edison, and follows on two other books about mice who were the “real” inventors. The other books are Armstrong, and Lindberg. I expect that the series will continue with other mouse inventors as time goes on. Meanwhile, Edison is a very en-lightening (pun intended) illustrated children’s book.